Briton's spend around 10 per cent of their annual salary on their holidays a survey has found. A report by Nationwide FlexPlus also found that holidaymakers spend £40 a day while on their trip and nearly three in 10 say they do not worry about how much they are forking out when they are away. However tourists can save themselves hundreds of pounds by taking out trusted travel insurance. City breaks and beach hotel holidays are the most popular types for Britons, the study of more than 2,000 holidaymakers from across the UK found. More than one third (35%) say their preferred trip is an all-inclusive package holiday deal, while 19% prefer an adventure holiday. 16% of people favour a cruise and 13% prefer to go caravanning or camping. As well as a main annual getaway, short trips to recuperate from the daily grind are also found to be popular, with Britons taking on average four short breaks of less than three days away each year. Many also like to have their home comforts on their trip, with around one in 10 taking tea bags away with them. People in London and the North East of England are the most likely to take a multi-generation holiday while those in the North West and Wales are the least likely. Holidaymakers in Newcastle were the most likely to be planning a multi-generation holiday in the next 12 months, while those in Edinburgh were the least likely to be planning to do so, the research among more than 2,000 holidaymakers from across the UK found. Nearly three-quarters of those surveyed think multi-generation holidays give parents an opportunity to relax more as grandparents can keep watch on the children. When it comes to planning their packing for their trip, the research suggests women start on average around six days in advance, while men start four days beforehand. 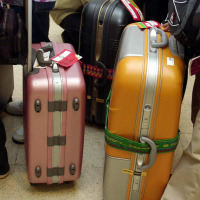 Holidaymakers in Liverpool and Newcastle were the most likely to plan their packing well in advance, starting six days before their holiday. Those in Brighton were the most likely to leave their packing until just a few days before they went away, typically starting three days before their holiday.